One of the new cool features which came with Xtext 2.3.0 is a wizard which generates all the artifacts to build your Xtext DSL project with Buckminster; this will allow you to easily build your Xtext project p2 site and also to build your project and its tests headlessly (e.g., from the command line, and, more importantly from within a continuous integration system like Jenkins). This new feature was not advertised much, nor documented, so I decided to write a tutorial about that, also with the permission of the developer of this feature Dennis Hübner. In the end, I will also try to describe/explain all the Buckminster files that the wizard created for you, so that one can customize them. and then, of course, we generate Xtext artifacts. 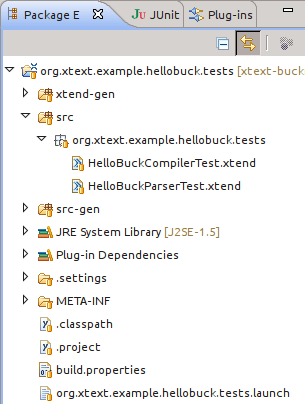 Note the org.xtext.example.hellobuck.tests.launch Launch configuration that Xtext created for you (which basically runs all the Junit tests in this project. We will see how this will be used later. 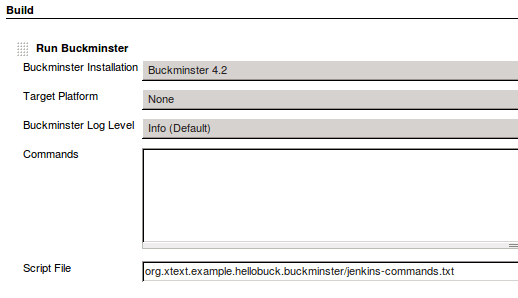 In any case, specifying the headless Buckminster installation path is only useful if you intend to build your projects headlessly with ant (it is not requested for building in the IDE, nor if you plan to build it with Jenkins by setting job using the Buckminster Jenkins plugin, as we will see later). Before pressing Finish, we also want to specify the tests to launch during the headless build, so we press the button Add and we select the launch configuration in the .tests project which the Xtext wizard created for us. If you want to build an existing Xtext project and you do not have that launch configuration, all you need to do is to simply create a new plain Junit launch configuration from the IDE, for instance, to run your existing Junit test suite, and save it in the .tests project yourself. You can also configure the headless build to run tests later on. org.xtext.example.hellobuck.site which is a feature project to create the p2 repository for your Xtext project. Although the .buckminster project created by the wizard is thought to be used in an headless environment, the .site project is useful also to build the p2 repository from the IDE itself! Indeed, if you created an old style update site, you could build the update site from the IDE itself. But if you switched to the new category.xml format, then building the corresponding p2 repository from the IDE is not straightforward. so that Buckminster will generate all its artifacts in the tmp/hellobuck directory of your home folder. [exec] INFO: Elapsed time: 1.164 seconds. It will also tell you where you can find the generated p2 site. IMPORTANT: there’s a bug in the currently generated build.ant file, which prevent you from building with ant in Windows; until the fixed version of the wizard is released, you need to make sure that the build.ant has the right contents, as in this example source. It may be interesting to learn more about the files that the Xtext Buckminster wizard generated for you (at least, I personally found instructive to look at them, and learned something about Buckminster 🙂 most of which I described in another post of this blog). The details might also help you if you need to customize the generated files. thus, due to its dependencies, it represents the target platform for your Xtext project. 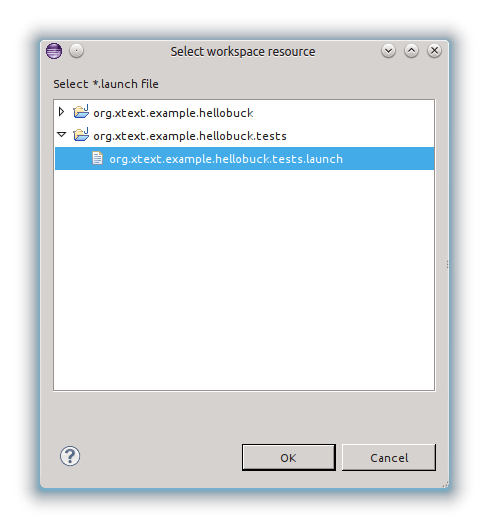 If your Xtext project required some further specific dependencies to build and test, this is the place to express them! To materialize components and dependencies with Buckminster, you need a Resource Map (RMAP), and the wizard created two maps: one containing p2 repositories location (for materializing the features of your target platform), called projects-platform.rmap and one for binding your projects to the workspace (when building headlessly), called project.rmap. 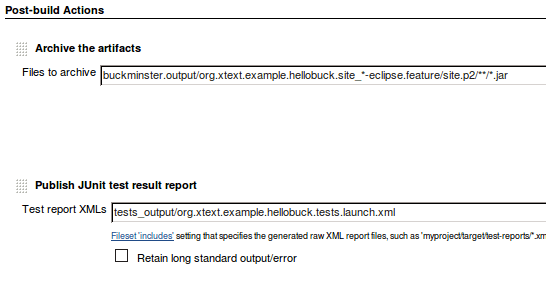 This basically tells Buckminster to take all Xtext stuff (including additional components like Google Guice and Antlr) from the Xtext main repository, and to use the main Eclipse Juno release repository for everything else. However, it also redirects to project.rmap for resolving the main Buckminster component of our project org.xtext.example.hellobuck.buckminster. Then, you have to Component Query files (CQUERY): projects-platform.cquery, to materialize the target platform, and project.cquery, to materialize your projects in the workspace. The first one could also be used in the IDE to actually materialize the target platform in your workspace (instead of using a target definition file); the second one is useful when building headless. Note that this cquery has an advisor node to skip .source components: thus, the materialized target platform will not contain the sources for all the features. This is useful headlessly to reduce the time to materialize the target platform. But if you use it also for materializing the target platform in the IDE, then sources are useful to inspect Java classes, and you might want to remove this advisor node (or simply create another cquery only to be used in the IDE, without that advisor node). This query refers to projects-platform.rmap. As it usually happens when using Buckminster, the cquery for materializing the projects in the (headless) workspace refers to a single feature project which, transitively refers to all the bundles and additional features of your application. Usually, this is the feature project for building the p2 repository, like in this case. 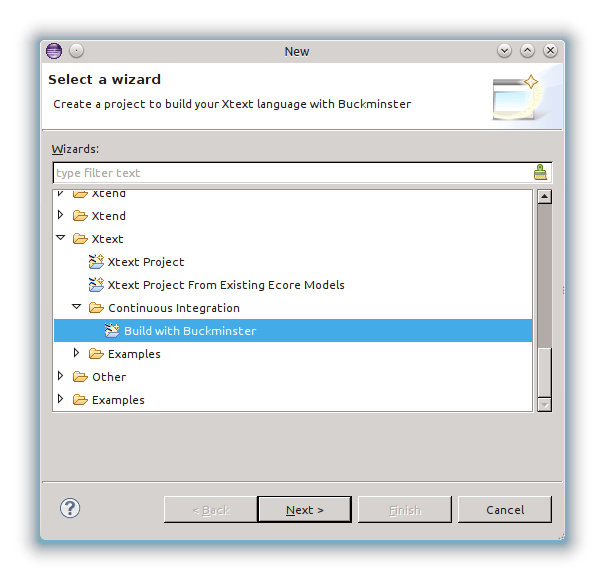 Note that the .sdk.source feature is not a “real” feature project in your workspace, but, by default, Buckminster will automatically build a source jar for all your features and bundles. That’s all! Many thanks to the author of this wizard, Dennis Hübner, for making it and for many suggestions! 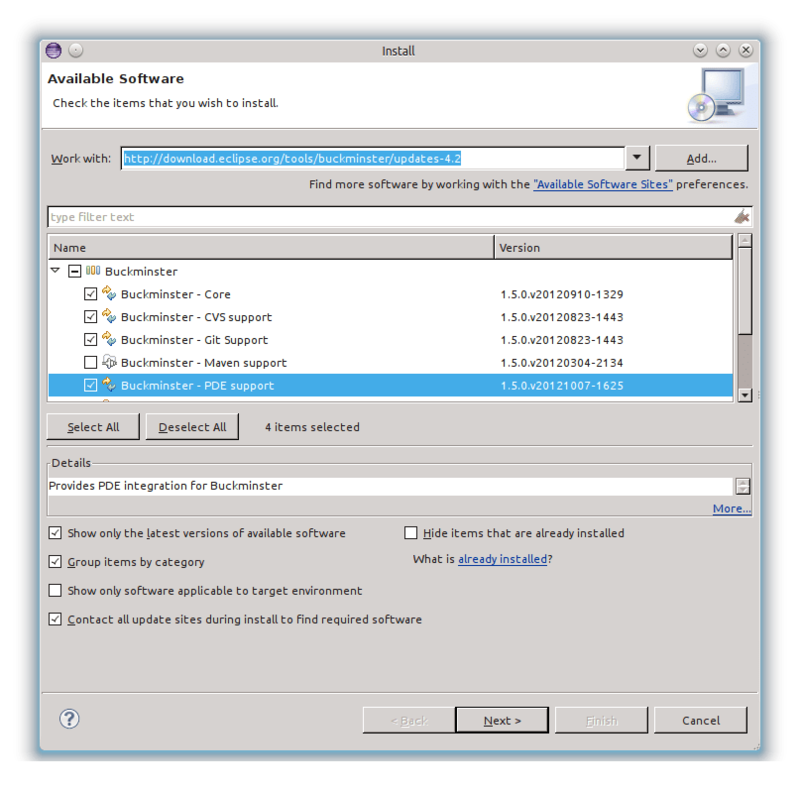 This entry was posted in Tutorials and tagged buckminster, eclipse, xtext on November 14, 2012 by Lorenzo Bettini. I’m trying to build the project with (ant and java1.8) but I keep getting the following errors. –> Annotations are only available is source level is 1.5 or greater. May be it’s a dumb question. Any help is appreciated. sorry for the delay; I see that you have already posted on the newsgroup anyway and they provided you some hints.